Installing a security camera is a great way to keep an eye on the people, pets and stuff you love the most when you’re not home. The updated Canary All In One smart home security hub is totally up to that task. It has an HD camera, siren, and an air monitor. It’s built to learn and sends intelligent alerts with video and audio directly to your phone. It even has a two-way talk feature — so you can check-in anytime, from anywhere. 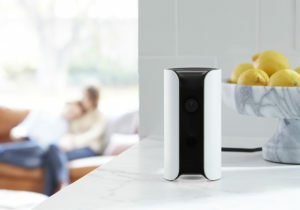 When your kids get home from school, you can use the Canary to see and talk to them through the camera. And they can talk with you. So you can help them put together a snack, or tell them to feed the dog and get cracking on their homework – all without leaving work. Because the Canary allows several people to check-in remotely, you can even pull your spouse or other people into this conversation, from wherever they are too. This particular two-way talk feature is also super handy for chasing the dog off the couch. The Canary also installs an alarm button on your phone that you can tap to let loose a 90-decibel siren. This is great, obviously, in situations where a real break-in has occurred. But it is more likely that you’ll use it when you suspect your spouse is stealing your chocolate stash, or you see your teen has a friend over when they’re supposed to be studying for a test. Surprise! When the Canary sees motion, you look at your phone (or tablet or computer) to see what’s happening. If you catch an actual thief in the act, tap the alarm and scare the pants off whoever is rummaging through your stuff. Revenge and knowledge all at once! It is also a temperature, air quality, and humidity monitor too. But the best of all? We are giving the away brand-new, updated Canary All in One – with a month of free service so you can try all the features. After that, you’ll pay $10 a month – a small price to pay for two way talk, unlimited videos, 30 days of viewing history stored online, and a post-incident support team.